Tiny microbes called phytoplankton are churning away in the oceans, taking in carbon dioxide and producing the oxygen we breathe. Scientists recognize their value, but many questions remain about what will happen to their productivity as the oceans warm, carbon dioxide levels rise, and the nutrients they rely on become scarce. A new study published online today in the Proceedings of the National Academy of Sciences explores those questions using a mix of techniques from genomics and oceanography and a newly created database of millions of phytoplankton RNA strands contributed by scientists from labs around the world. 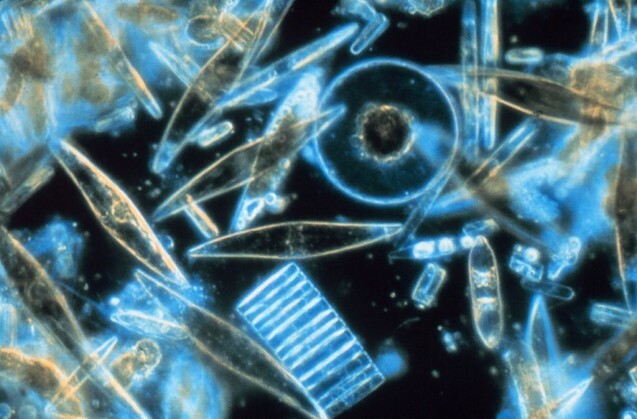 The study focused on the activity of phytoplankton in the North Pacific, particularly diatoms, which create glass shells from silica and are important for sinking carbon deep into the oceans. The scientists simulated blooms in phytoplankton communities and found that the diatoms stood apart for their quick and large response to increases in nutrients. The scientists also identified some of the major limiting factors that can prevent phytoplankton blooms, including shortages of resources like phosphorus, nitrogen, vitamins and trace metals. To identify each phytoplankton type and track its activity, the scientists borrowed a technique from genomics and looked inside the cells. All living cells create ribonucleic acid, or RNA, to carry instructions from the cell’s DNA to create proteins that turn on or off various activities. By matching RNA strands in the database with RNA found in ocean water samples, the scientists were able to paint a picture of an entire phytoplankton community, showing which types of phytoplankton dominated and what each type was doing at any point in time. Harriet Alexander and Sam Wilson check on the simulated blooms in special incubators that maintain proper light and temperature. Photo courtesy of Harriet Alexander. The new RNA database from the Marine Microbial Eukaryotic Transcriptome Project, led by the Gordon and Betty Moore Foundation and the National Center for Genome Research, made the study possible. “One of the most exciting things perhaps is that even with this massive expansion in the coverage of RNA from many different species, there still exist a significant fraction—about 40 percent—of our RNA sequences in this area that we can’t identify,” said Harriet Alexander, the lead author of the study and an MIT-Woods Hole Oceanographic Institution Joint Program graduate student. “Some of these mystery sequences may belong to organisms central to ecosystem function. We have a lot more to exploration to do both in the ocean and in genomes,” Alexander said. 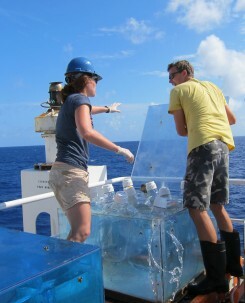 The study used samples collected during a rare summer-long expedition at one of the major time-series water column research sites, Station ALOHA, where researchers have been collecting data for years. The scientists took two types of samples—one from the upper water column where phytoplankton live, and one 700 meters below the surface, where the water is richer in nutrients. By adding the nutrient-rich deep water to the surface water, they could simulate a bloom. The diatoms in particular grew quickly into blooms in the high-nutrient mix, creating energy and turning off their nutrient-searching genes. “They had to work extra hard in the surface environment, but once resupplied, they were able to put those transcripts into growth and energy,” Dyhrman said. Other types of phytoplankton were not as efficient. The new findings will help improve computer models to better predict how types of phytoplankton and their ability to sink carbon and produce oxygen will respond to ocean changes in the future. The warmer the ocean becomes, the less water rises from deeper down, meaning fewer resources will be brought to the surface water where phytoplankton live. Carbon dioxide levels, meanwhile, are rising. Models can explore how those changes will impact future phytoplankton communities if they can start with an understanding of how today’s communities behave. Co-authors on the paper include Monica Rouco and Sheean Haley of Lamont-Doherty Earth Observatory, and Samuel Wilson and David Karl of the University of Hawaii. The study was primarily funded by the Center for Microbial Oceanography: Research and Education (C-MORE) and the Simons Foundation.